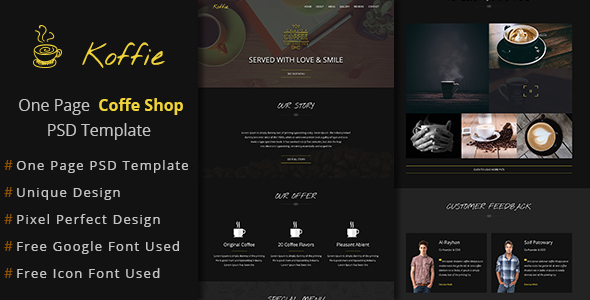 Koffie-Multi-purpose One Page PSD Template Created by OnlineArpon. This templates have specific characteristics, namely: Koffie-is a one page creative beautiful template suitable for any coffee shop, cafeteria, bar, cafe and small . You can use this Koffie-Multi-purpose One Page PSD Template on Psd templates category for black, brown, cafe, coffe, coffee, dark, drinks, entertainment, food, Koffie, modern, multi purpose, restaurant, rich, shop and another uses. Koffie-is a one page creative beautiful template suitable for any coffee shop, cafeteria, bar, cafe and small restaurants.